There are 3 cases where players go on waivers. A player's game has started, at which point they go on waivers until Monday or Tuesday night (Note: Tuesday waivers technically translate to Wednesday 12:05am). A player goes on waivers if he is dropped by an owner and was owned for more than 24 hours. By default they go on waivers for 2 days (48 hours) from time of drop, but this is configurable. You have turned on continuous waivers, which means there is no FA, and waivers are cleared once a day. What types of Waivers do you support? 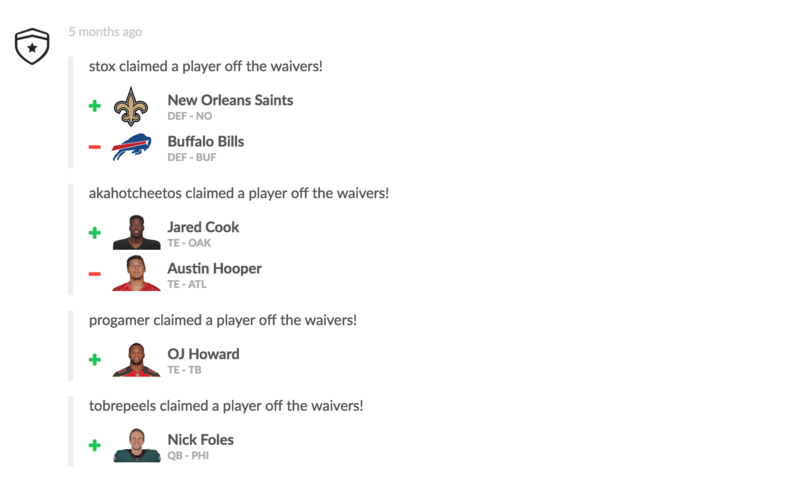 Because of our technology, we can process waivers instantaneously for your league. We turn the waiver processing event into something the league can enjoy, and we call it Waiver Countdown. 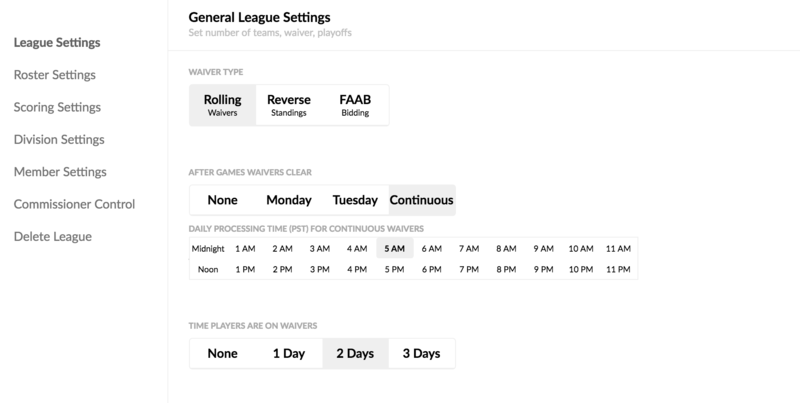 The Waiver Countdown turns your Tuesday waivers experience into a major weekly event that your leaguemates will look forward to. Spamming refresh on your league while not knowing if your waivers will process at 1:00am or 4:00am is a thing of the past. Sleeper Leagues processes Tuesday waivers at exactly 12:05am, every week, and not a second later. A summary is then displayed immediately in your league chat for all to see. Owners have the opportunity to gloat aloud or voice their regrets. It’s like upgrading your QB from Brock Osweiler to Aaron Rodgers. Waiver Countdown is possible because of Sleeper’s Instant Waiver Processing technology. We engineered Sleeper Leagues from the ground up to be faster than any other platform. You’ll notice that every interaction in our app is faster, and waivers are no exception.